BBC Arts & Culture - Jane Austen: What books were on her reading list? Jane Austen: What books were on her reading list? Pride and Prejudice was published two hundred years ago. But what were the popular novels of the time? Who was Jane Austen reading, and who influenced her writing? Books were an expensive luxury two hundred years ago. In 1810 a new novel would have cost around £100 at today's prices, or around half a week's wages for a skilled worker at that time. Sense and Sensibility (1811): Austen worked on it from 1797. Its title page read "by a Lady"
Purchasing new works of fiction would have been beyond the likes of the modest Austen family. Jane, who read extensively from a young age, relied on her family's libraries, borrowing from friends and Circulating Libraries. Works of the time were mainly gothic, sentimental melodramas. The Mills & Boon or Harlequin novels of their day. Dr Gillian Dow, of Southampton University and director of research at Chawton House Library, says they were read and loved by Jane Austen as much as poetry, classics and works from the Continent. She also read 'Conduct Literature for Women', which instructed aspiring ladies on the correct standards of behaviour and even warned against the danger of novels on impressionable female minds. Their subtext was how to secure a suitable husband. Austen's letters, family biographical notes and novels are peppered with admiration for different writers and works. But she kept no formal record of her reading habits. Ann Radcliffe (1764-1823) was the pioneer of the Gothic novel and well-known in her day. Her vivid descriptions of landscapes, travel and romance mixed with the final revelations of supernatural events were what helped give the gothic novel respectability. It also gave Austen the material for Northanger Abbey, in which 17-year-old Catherine Morland is obsessed with Radcliffe's Mysteries of Udolpho. Novelists Frances Burney and Maria Edgeworth were extremely popular contemporaries of Austen's. Both are said to have influenced her writing. Burney had much to say about the politics of society, employing satire and wit. Edgeworth, known as the Irish Jane Austen, was one of the most influential writers of the time. Austen was said to admire her use of humour and circumstantial irony. '"The whole of this unfortunate business," said Dr. Lyster, "has been the result of PRIDE and PREJUDICE. ... Yet this, however, remember: if to PRIDE and PREJUDICE you owe your miseries, so wonderfully is good and evil balanced, that to PRIDE and PREJUDICE you will also owe their termination..."' (Frances Burney, Cecilia). But Austen also admired little known writers such as Charlotte Lennox, who had a long career writing poetry, prose and drama. Her novel The Female Quixote or The Adventures of Arabella (1752) was a model for Austen's Northanger Abbey. Amongst the many male writers she favoured were Samuel Johnson, William Cowper, George Crabbe, Robert Burns, Walter Scott and Henry Fielding. By all accounts Samuel Richardson was the writer she consistently read, re-read and quoted throughout her life. Her particular favourite was his epistolary novel The History of Sir Charles Grandison, In a Series of Letters. He is said to have been a big influence on her teenage writing. In biographical notes and memoirs, her brother and nephew's version of Jane's reading does not reflect the breadth of what she appreciated. According to Dr Katie Halsey of Stirling University (in Jane Austen and her Readers, 1786-1945) it was in keeping with would have been deemed proper for someone of her background. Jane also had a fondness for celebrity gossip. Both Sense and Sensibility and Pride and Prejudice were littered with names which alluded to famous families, leading to speculation as to their anonymous author and what she knew. Austen highlighted the frustration and limitations in which young women lived their lives with barbed, often witty, reflections about her contemporaries and comic references to the conduct literature. New titles increased from around 400 in the 1780s to 701 in the 1790s. In 1797 Jane's father sent a speculative letter to Thomas Cadell, Frances Burney's publisher, drawing favourable comparisons between Austen's First Impressions and Burney's EvElina. The book was rejected. Between 1800 and 1810 new works published dropped by 20% from 1800. What fascinates Dr Anthony Mandal of Cardiff University is how Austen moved so easily between the worlds of writing and reading. Rather than being an isolated genius, as her brother and nephew argued, he says she was well aware of the competitive world of publishing and learned how to work in it. 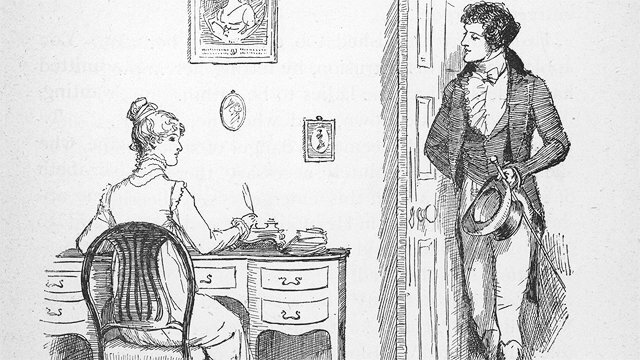 Jane Austen printed four novels in her lifetime, with two being published posthumously. Following a period of twelve years out of print, a collected single volume edition of Austen's novels was published in 1833 by publisher Richard Bentley. It was reprinted continously in the following decades and laid the ground for Austen's modern following.